How do I know who I assigned which page to? Go to the overview page of your magazine, click a page and then click ‘move’. Now you will see an overview of all the pages, with the corresponding editors. Tip: Before you start assigning pages to editors, put the name of the person you want to assign it to on the page using a text block. This way you can see which pages won’t be assigned to anyone. I invited an incorrect e-mail address. If you’ve typed an incorrect e-mail adres the page becomes occupied. However, you can undo this by deleting the invitation to the wrong e-mail address. Delete the invitation by clicking the white trash bin next to the e-mail address. The page will automatically be released and you can now invite the correct e-mail adres to edit the page. Check to see if you’ve used the correct e-mail address for the invitation and ask the person you’ve invited to create a (new) account with the same e-mail address. After they’ve logged into their account they should be able to see the invitation to start working on the magazine. How do I make someone co-editor-in-chief? You can make someone co-editor-in-chief after they’ve accepted their invitation and have become part of the editing team. Then, click on their name and add a check mark to make them co-editor-in-chief. You can also choose to make someone co-editor-in-chief when you send them an invitation to edit the magazine. A co-editor-in-chief is able to edit all the pages, just like the chief-editor. It is therefore not possible (or needed) to assign pages to a co-editor-in-chief. Important: Make sure you’re not working on the same page as the co-editor-in-chief! How can I tell if a co-editor-in-chief and myself are working on the same page? 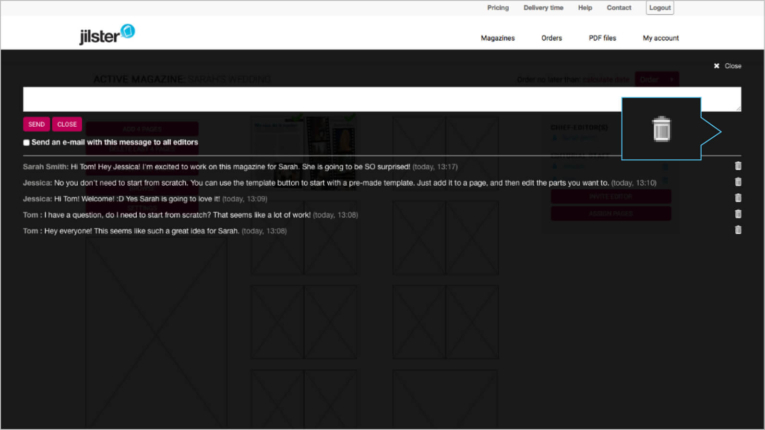 You can communicate this to each other via the chatbox in the page overview of the magazine you’re working on. How do I assign multiple pages to an editor? Click the ‘assign pages’ button in the page overview of the magazine. Choose the editor you want from the drop down menu on each page you’d like to assign to them. Can I (as an editor-in-chief) hide certain photos from other editors? No, as a chief editor you cannot hide photos. The entire editing team can view and use all the photos in the magazine they are editing. A communal photo folder is used. The photos that have been uploaded can be used on every page. If you don’t want to display certain photos, you can create a second magazine and upload these photos to the second magazine. Then you will be able to select the photos from this photo folder without your editing team being able to see them. I want to work together with editors that speak different languages. How do I do that? When you’re preparing an invitation in the editor you can select the language the invitation will be sent in. You can choose from English, Dutch and German. Can I send private messages to individual editors in the chat box? It’s not possible to send private messages to individual editors. All the editors that have access to the magazine can read all the messages in the chat box. An editor has ‘handed in’ a page, but would like to make some changes. How can they go back to editing the page? 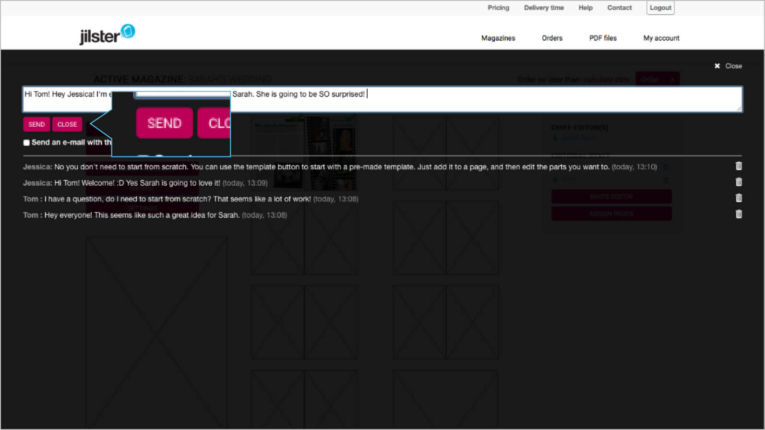 In the page overview, you can hover over the page and select ‘editor’. In the window that opens, add a check mark to ‘release page’ and click save. The page will be released to the editor. They will regain access to the page and will be able to continue editing the page. I received an invitation to edit but I can’t see the magazine? It is possible you’ve create an account with a different e-mail than the e-mail an invitation was sent to. Ask de editor-in-chief to invite you again using the e-mail you used to create an account. Alternatively the cause may be that your invitation has expired. Ask the editor-in-chief to send another invitation. What happens when I hand in my page? Once you’ve completed your page you can hand it in to the editor-in-chief of the magazine. You will no longer be able to edit your page once you’ve handed it in. The editor-in-chief can only place an order once all the pages have been handed in. Edit a page after handing it in? Ask the editor-in-chief to release the page to you so you can go back to being able to edit the page. I have ‘handed in’ a page, but would like to make some changes. How can I go back to editing the page? Once you’ve handed in your page you can no longer edit it. However, you can continue editing it by asking your editor-in-chief to ‘release’ the page for you. As editor-in-chief you can edit pages at all times, even pages that have been handed in or published. Once you’ve made changes to a page you’ll have to publish it once again. How do I solve the issue of a white screen in the editing room? You could also try using a different browser. Check out the Jilster FAQ. The FAQ has a lot of information on the entire magazine process from start to finish. It also contains information on working together in the online editor! Check out the tips and tricks section. It’s updated regularly with tips and tricks to help you use the online editor to make the perfect magazine. Including tips on design, layout and content! Have you already made a magazine or book with Jilster? We’d like to know what you think about the process. Contact us and let us know! Your story could also be featured on the website. 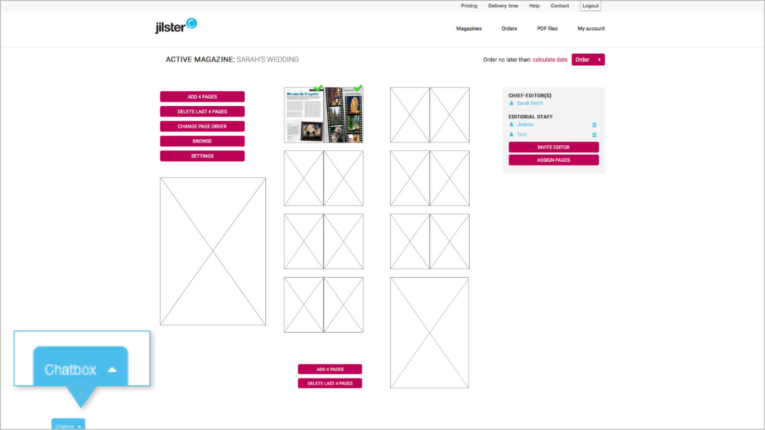 Invite friends and family to create a beautiful magazine together. If there's anything we can help you with, please don't hesitate to contact us. We're happy to help!